Post #50; A LIFETIME OF RESEARCH PAYS OFF; Day 357; April 25, 2015: On board: Jake Mycofsky; Elissa Mycofsky; Jim K.
For the first time this entire trip, we cast off the lines in the pouring rain. 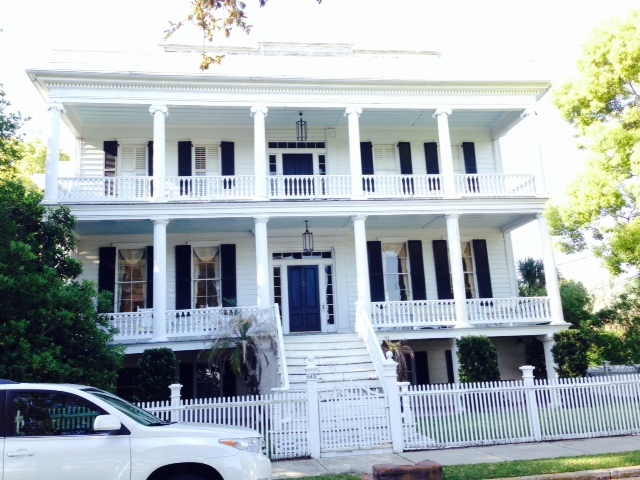 As much as we enjoyed Kilkenney Plantation, we didn’t want to spend two more days there, and nasty weather expected to last another day or two was predicted to arrive in the afternoon. So dressed in rain gear, off we went. Within an hour the rain had stopped, and by early afternoon we turned off the ICW to head 6 miles up the Savannah River against a current that runs up to 5 knots. Securing the boat in the falling tide at the Savannah riverfront in 5 knots of current was a challenge, and we doubled all the lines out of respect for the current and in deference to the upcoming storm – a tornado watch had been issued for most of Georgia and South Carolina. And what a storm it was! No tornadoes, but lightning everywhere, gale force winds, and torrential, horizontal rain. 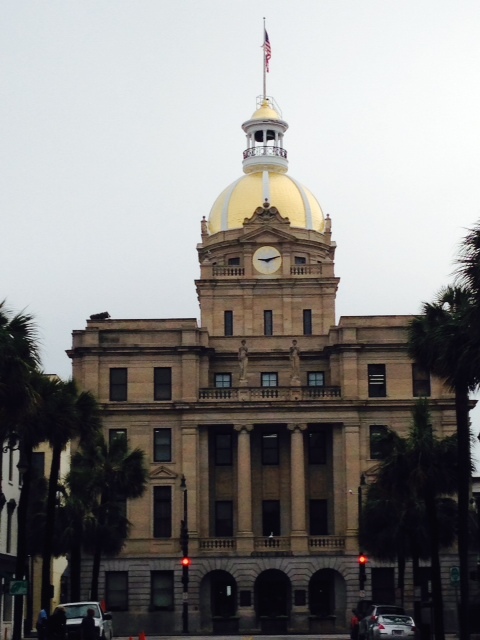 Despite such a tumultuous welcome to Savannah, the city exemplified the “southern hospitality” for which the region is famous. 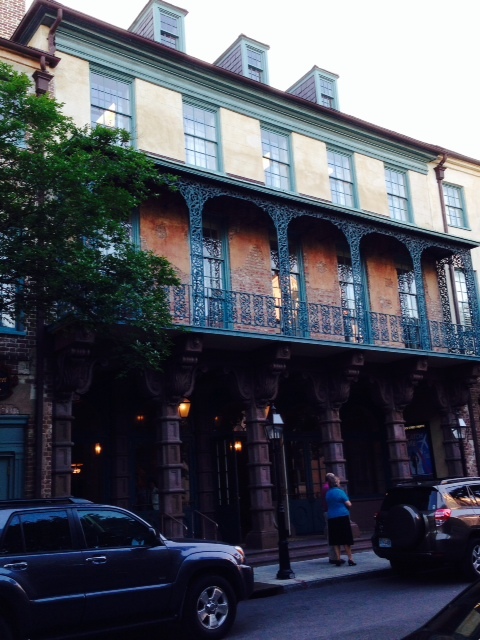 We spent 2 days in Savannah tied to the docks directly in front of the Hyatt Hotel in the middle of downtown Savannah, and could have stayed much longer. As we approached the city, we encountered a major dredging operation across most of the channel. 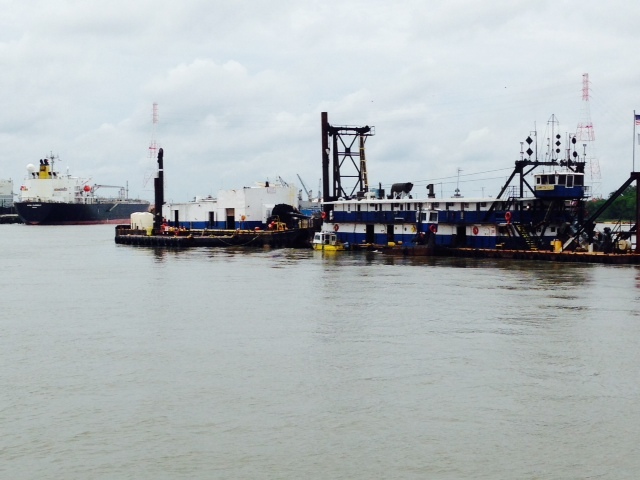 The river is being dredged to a depth of 50 feet to conform to the deepening of the Panama Canal which is also underway so that Savannah can accommodate supertankers and other behemouths that will soon be able to go through the Canal. 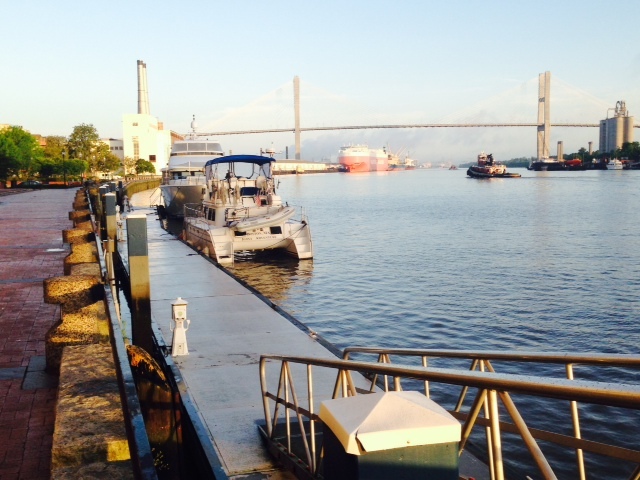 Failing to do so, officials fear, will cost Savannah dearly as the larger ships bypass Savannah and go elsewhere. 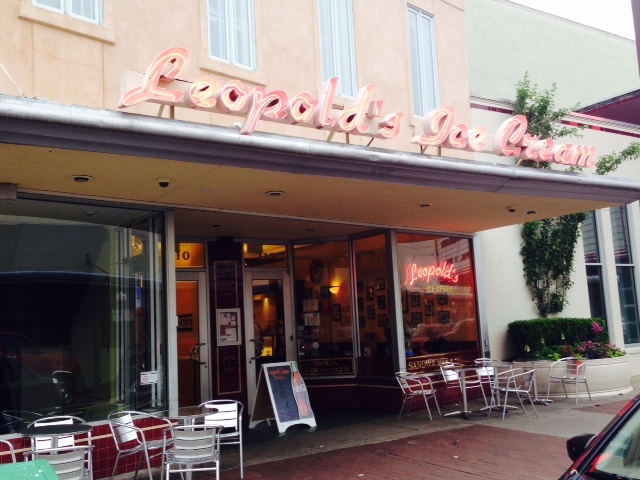 The Joint Adventure docked immediately adjacent to the Hyatt Hotel in the center of the downtown Historic District. The 185 foot high iconic cable-stayed bridge in the background was built in the 1990’s to replace a 139 foot high bridge in order to allow larger ships to enter the port. 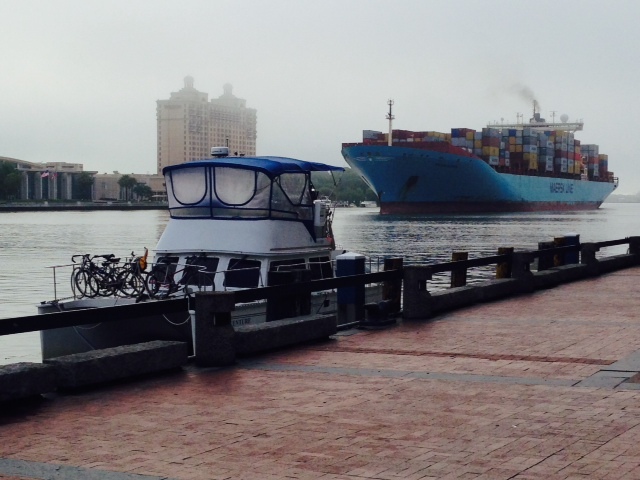 Surprisingly, the port of Savannah is the second busiest port on the Atlantic coast, second only to the combined New York/New Jersey port. 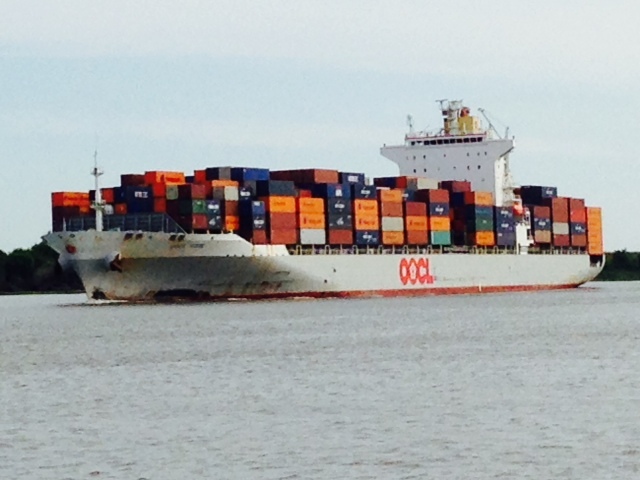 Enormous ships, most of them carrying up to 2,000 containers, passed by the Joint Adventure on their way up the Savannah River to loading docks just upriver from us. 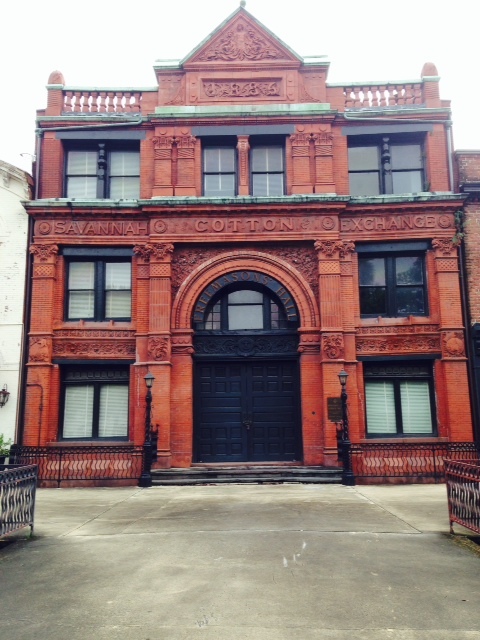 This is the Cotton Exchange Building – cotton was king in Savannah. 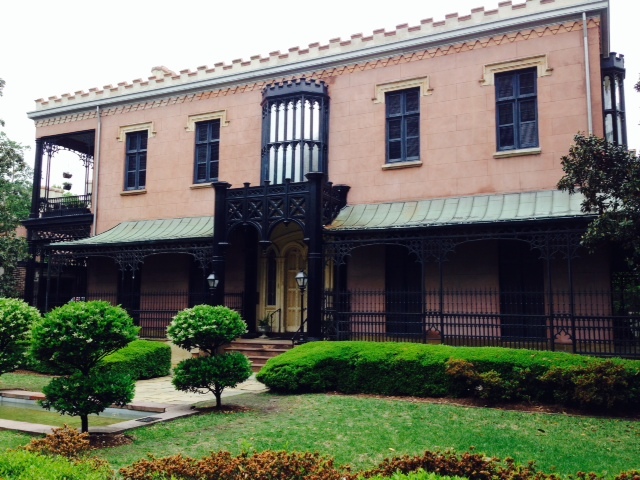 From the plantations throughout South Carolina & Georgia , it was shipped to Savannah where it was sorted, priced, and shipped to Europe or the northern states. 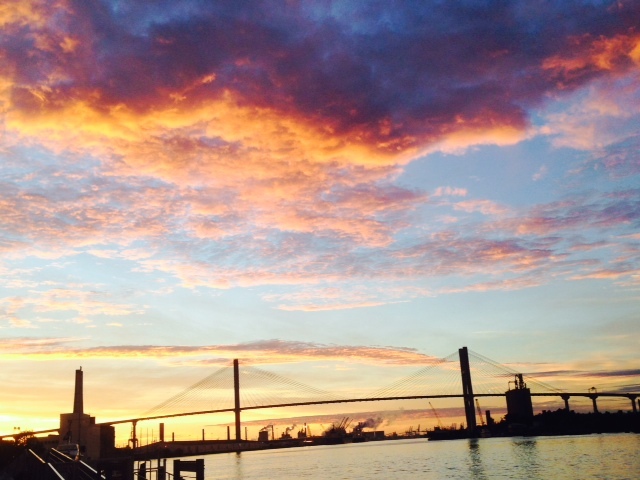 By 1887, Savannah ranked first on the Atlantic and second in the world as a cotton seaport. World prices for cotton were set in Savannah and London. 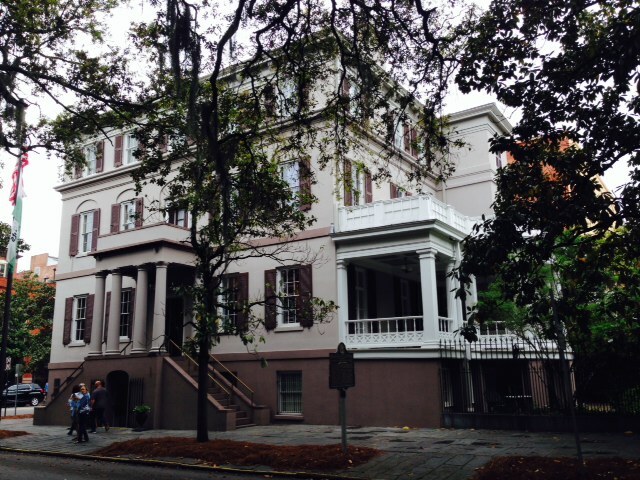 This building served as General Sherman’s headquarters in Savannah as he completed his famous “march to the sea” near the end of the war. 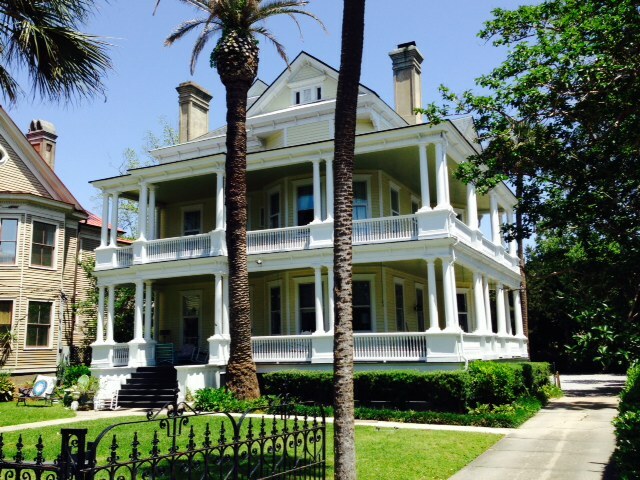 Sherman did not burn Savannah – knowing the futility of resistance at that point in the war, city officials negotiated a surrender of the city with Sherman, thus preventing it from being destroyed. 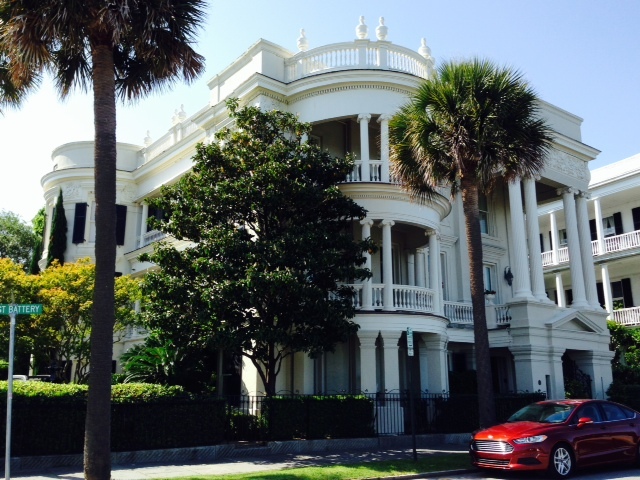 Sherman then sent his famous telegram to Lincoln at Christmas in 1864, presenting him Savannah as a “Christmas gift”. 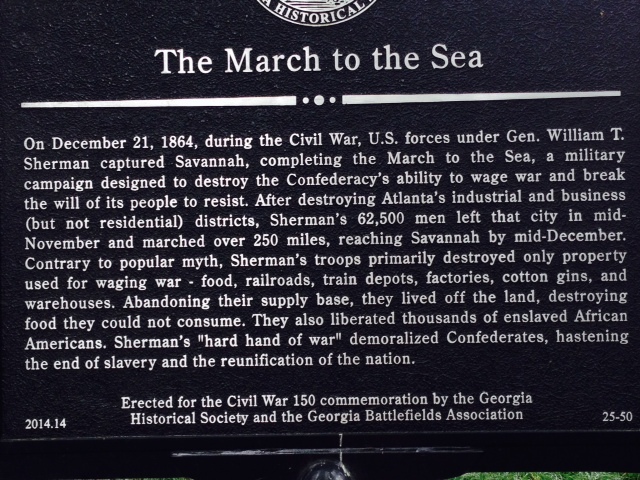 Interestingly, this placard near the Sherman headquarters provides a softer spin on Sherman’s march to the sea than is generally taught. 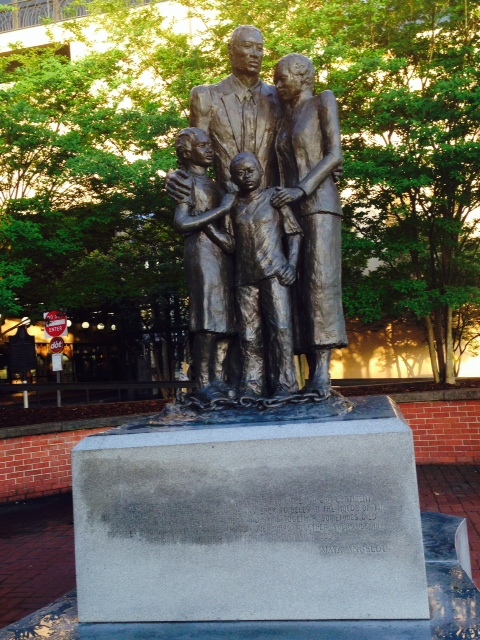 This statue of a slave family is displayed prominently on the Savannah waterfront. It’s message was so graphic and strong that I decided to recite it in full: “We were stolen, sold, and bought together from the African continent. We got on the slave ships together. We lay back to belly in the holds of the slave ship in each others excrement and urine together. Sometimes we died together and our lifeless bodies thrown overboard together. Today we are standing up together, with faith and even some joy.” Incidentally, slavery was illegal in Georgia under its first charter. The law was frequently ignored, however, and was repealed in 1750 because plantation owners claimed they could not compete with cotton grown in neighboring states using free slave labor. 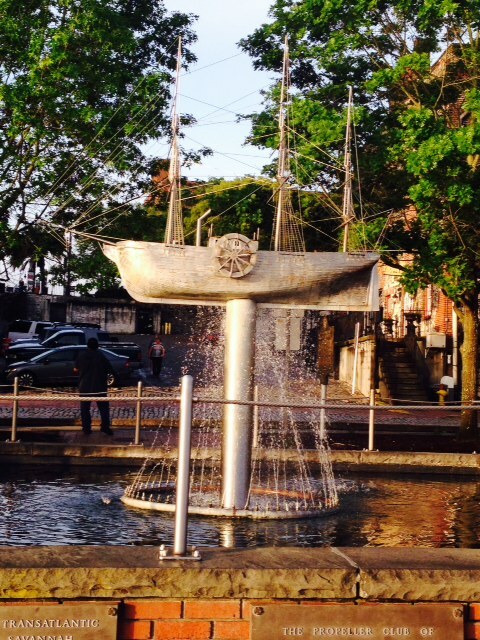 The “Waving Girl” statue memorializes the story of the woman who fell in love with a seaman who soon shipped out, promising to return to marry her. To insure she wasn’t missed, she met every arriving ship by waving a towel – for the rest of her life. 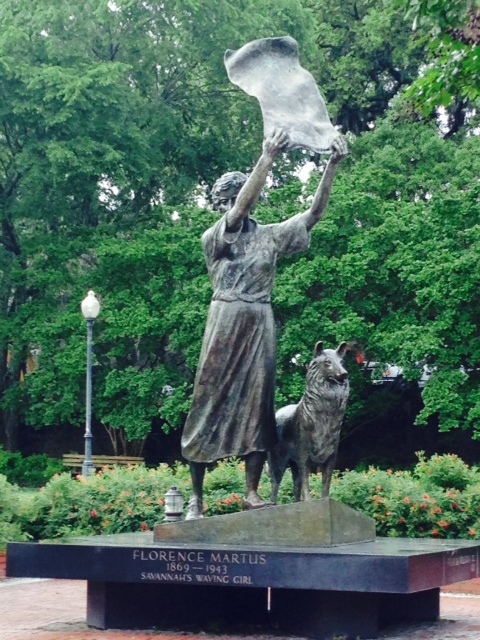 This sculpture on the waterfront celebrates a series of important ships named after the city of Savannah. One was the steamship SS Savannah which, in 1819, was the first steamship to cross the Atlantic – it was 98 feet long and produced just 90 HP – think of pushing a 100 foot ship with a 90 HP outboard. The crossing took 27 days, and used sails as well. By contrast, in 1959, the Navy launched a light cruiser of the same name – Savannah – powered by a nuclear reactor. During its entire 13 years of service, it used 163 pounds of uranium, which is the equivalent of 29 million gallons of diesel fuel. In WW II, 87 Liberty ships were built in Savannah – each could carry the contents of 300 railroad cars, 2,840 jeeps, or 440 Sherman tanks! 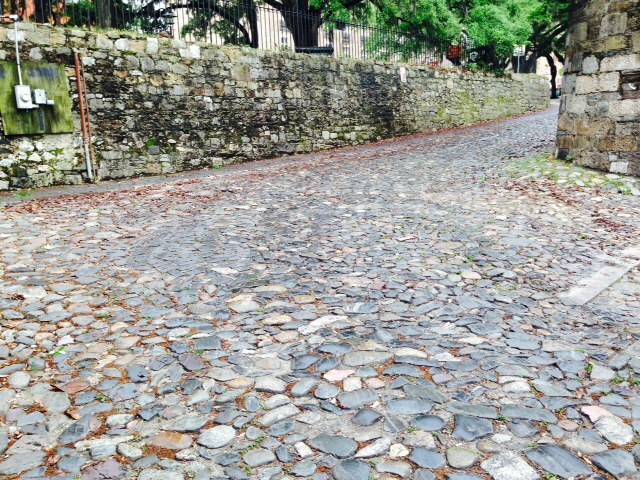 Some of the streets and some of the retaining walls in Savannah, especially along the waterfront, are made of cobblestones from all over the world – they were brought in sailing ships as ballast to add weight and stability to the ships coming to Savannah to take on cargo. The stones were offloaded to make room for the cargo, and were used for paving streets and building walls. 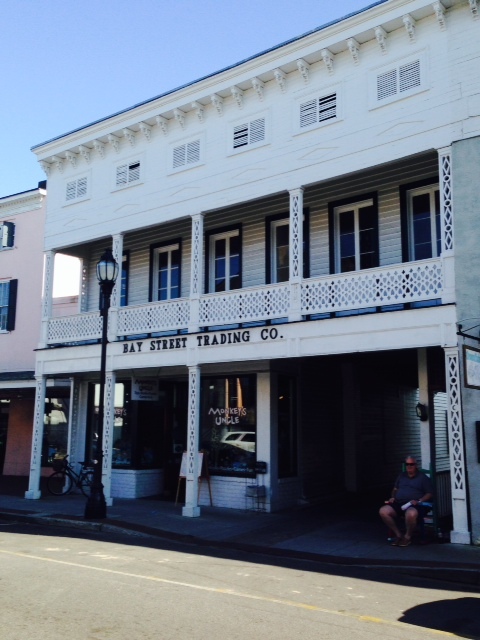 A historic mercantile building along River Street on the waterfront, the first floor of which now houses retail stores. 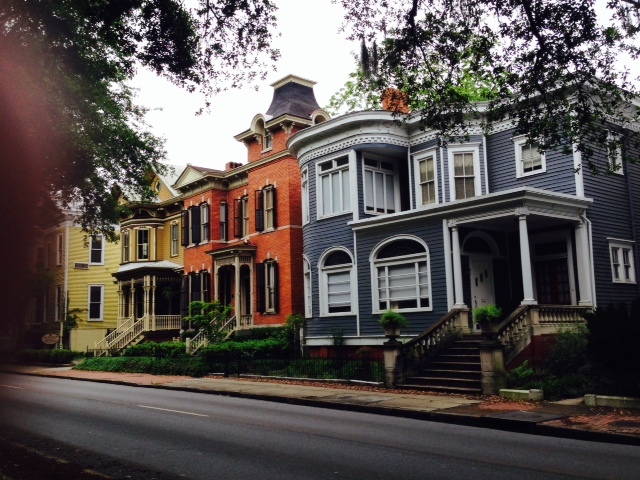 The Historic District in Savannah is the largest of any city in the US. 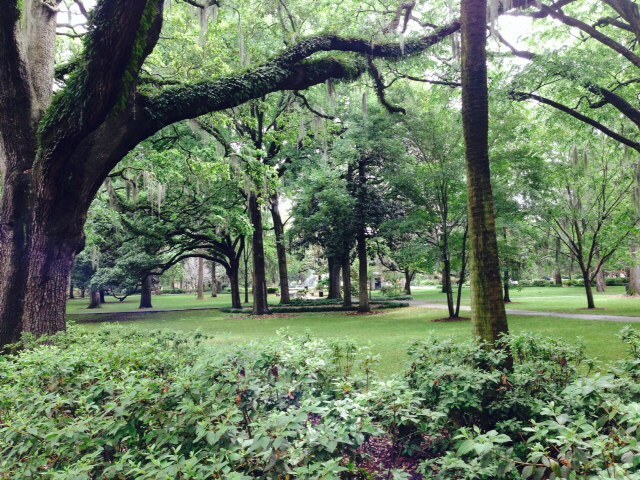 The Historic District terminates in an enormous public park which is as beautiful a park as I’ve seen. 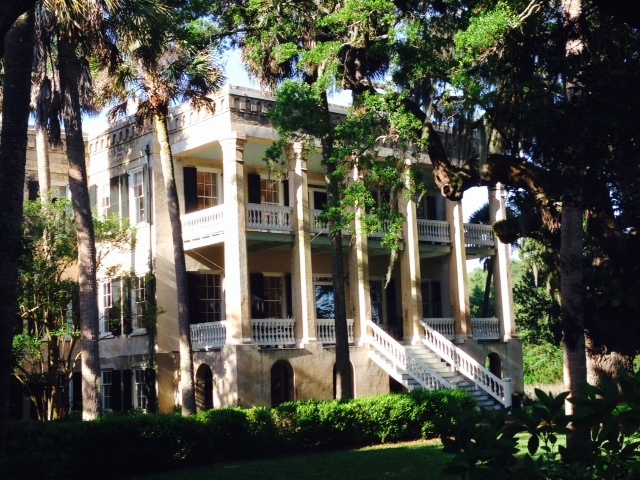 Among other species, it is adorned with huge live oaks covered with Spanish Moss hanging from the branches. Incidentally, Spanish Moss is neither Spanish nor moss. It is an air plant, and is not parasitic to the tree. It acquired the name because it reminded early explorers of the long beards worn by Spanish seamen. 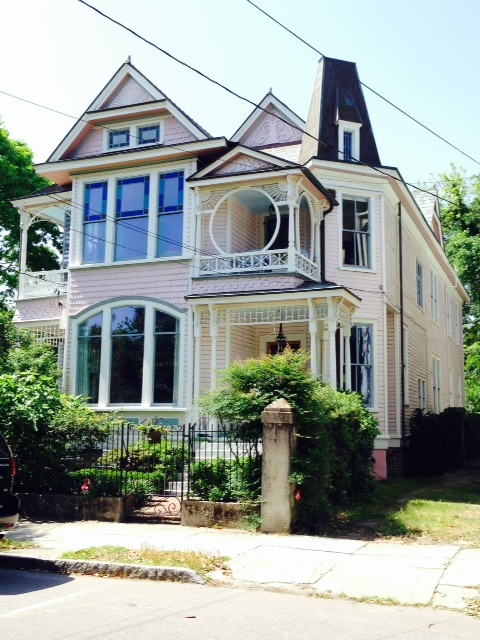 This is the birthplace of Juliette “Daisy” Gordon Low, born in 1860, who founded the Girl Scouts in 1912. 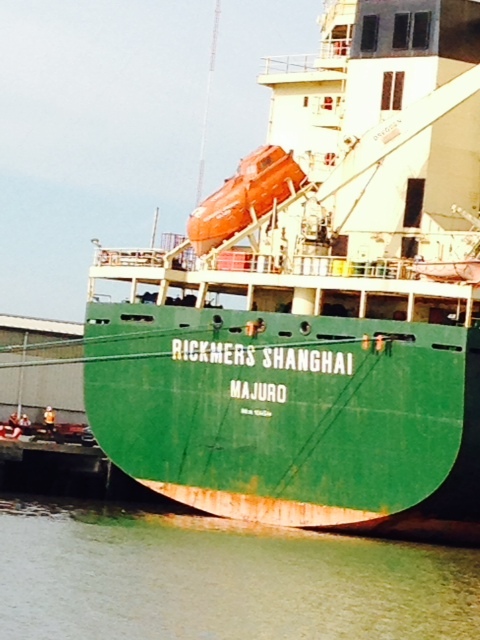 A “Captain Phillips” lifeboat on the stern of the ocean-going vessels. 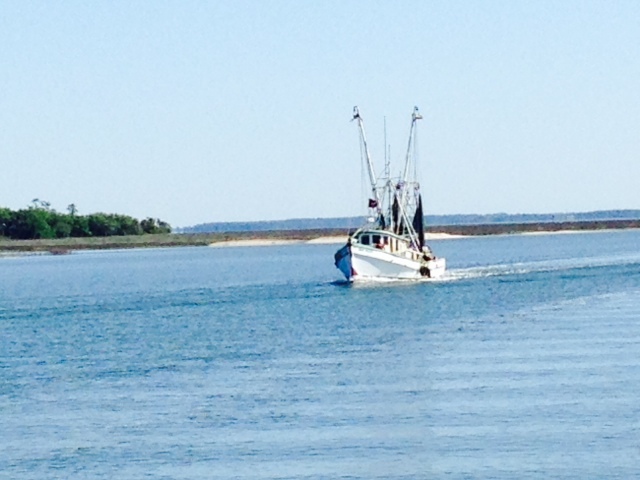 How would you like to be in that thing when it was released to drop 20 feet or more into the ocean? If you haven’t seen the movie “Captain Phillips”, it is a must-see movie. 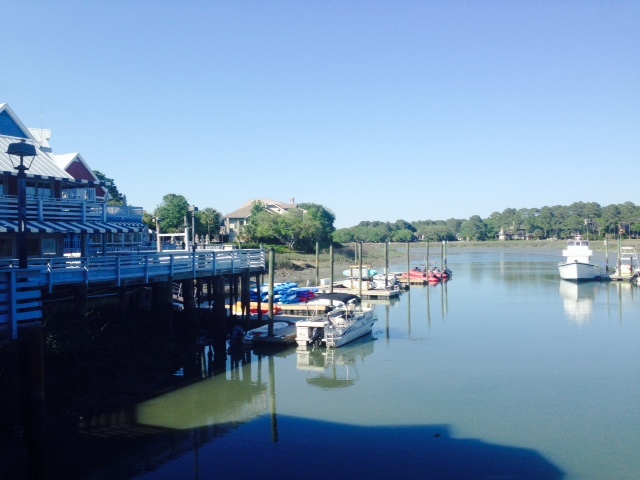 Harbour Town, the main harbor on Hilton Head, is identified by the iconic lighthouse at the harbor entrance. 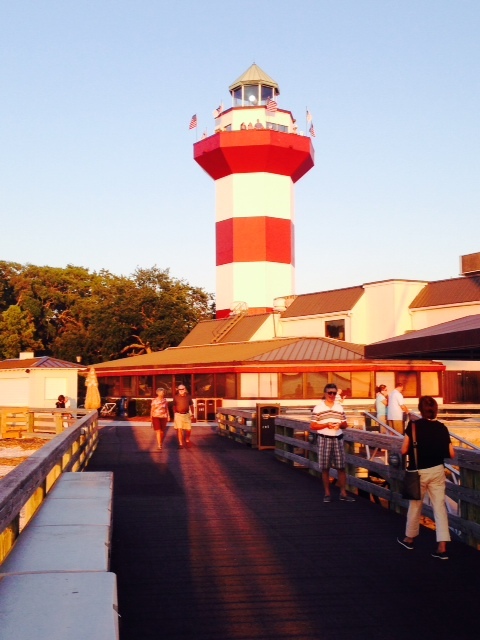 If you watch PGA golf events, you’ll recognize the lighthouse from TV coverage of the RBC Heritage on the Harbour Town Gulf Links, South Carolina’s only PGA Tour event. The resort surrounding the harbor is quite large, and includes four restaurants, numerous shops, jet ski rentals, condominiums, etc. 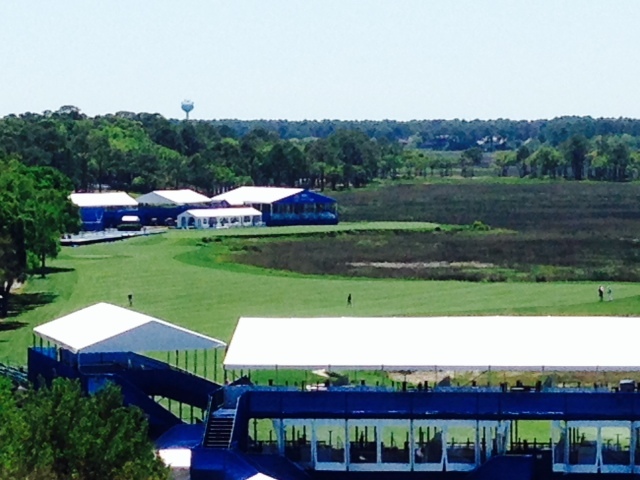 This is a view of the 18th hole of the PGA Tour course from the top of the lighthouse. The 18th hole tee is directly in front of the buildings in the background and the green is behind the grandstand (the white roof) in the foreground of the picture. I’m told that golfers take aim at the lighthouse on their first drive from the tee. TV crews set up their cameras on the lighthouse where I stood to take this picture to film the golfers playing the 18th hole in the PGA Tournament. 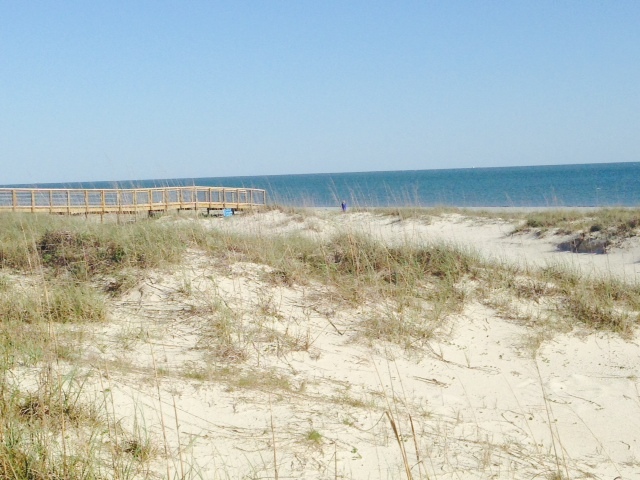 There are miles and miles of wonderful walking/bike paths throughout Hilton Head Island, many of which wind through pine forests while connecting the various destinations throughout the 41 square mile island. 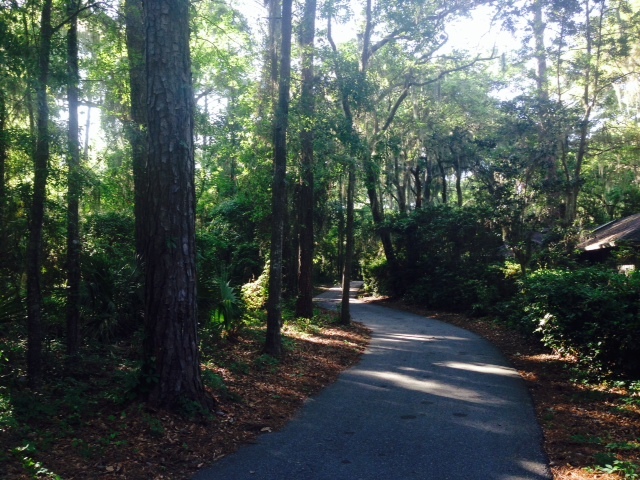 The walking/bike paths often pass by or though the many golf courses on the island. This is a green on the PGA course, each of which has a grandstand for spectators. 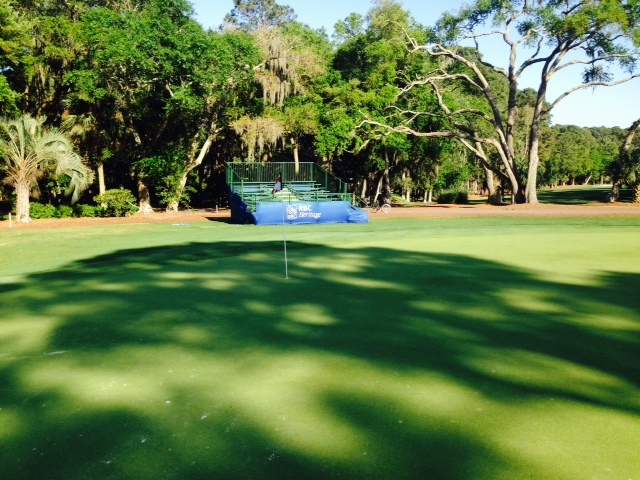 You can play this course for a mere $150/round and have your friends watch you from the stands…. A small harbor elsewhere on the island. 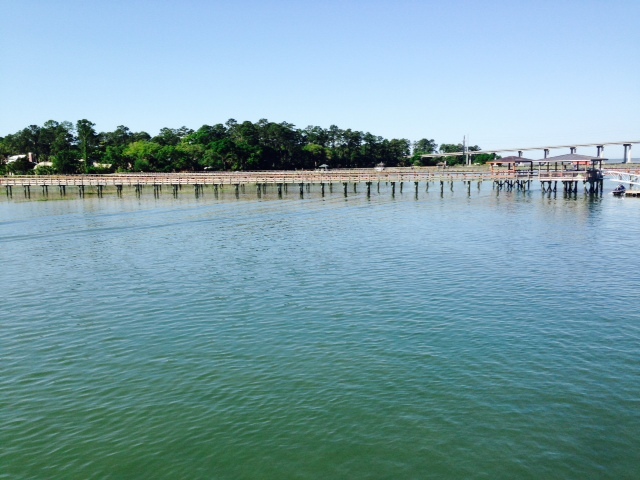 There are tides up to 9 feet at the island – this picture is taken at low tide. 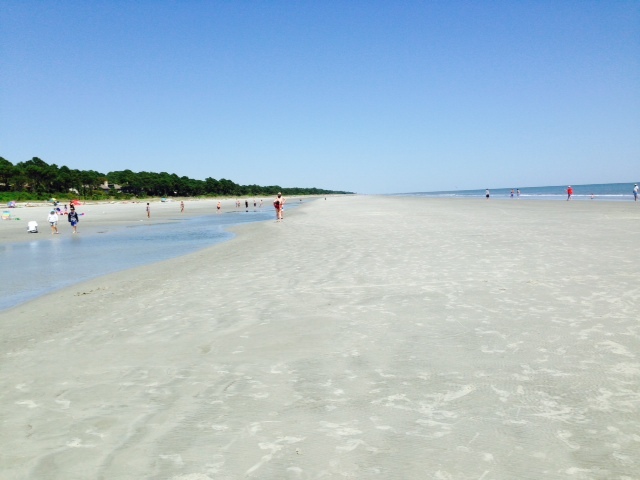 Hilton Head is, of course, also known for its beaches, which are extraordinarily wide at low tide, They are truly beautiful, but the sand is brown and a bit silty – not quite the caliber of the beaches of South Florida (what a snob…). 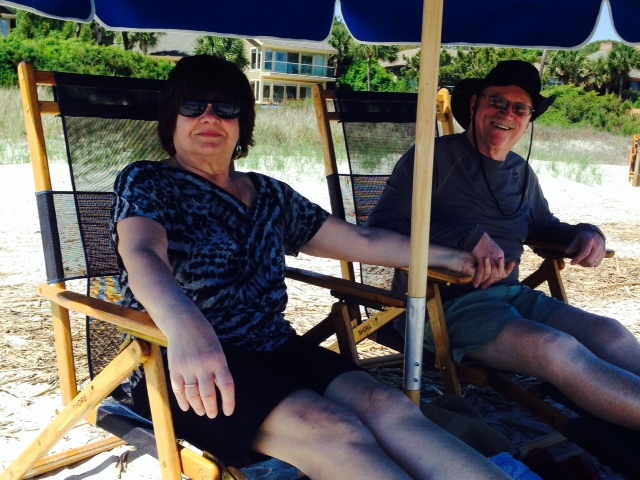 Jake & Elissa taking in the sights and enjoying the perfect weather the day of our visit. 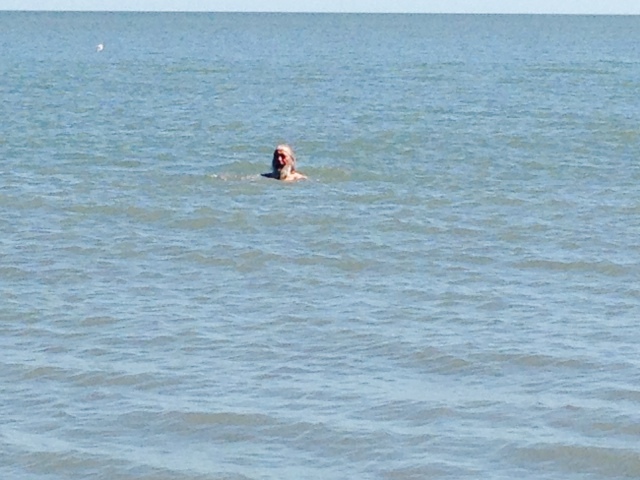 I couldn’t resist a swim, although this may be my last of the trip – the water is getting colder as we continue our journey north! 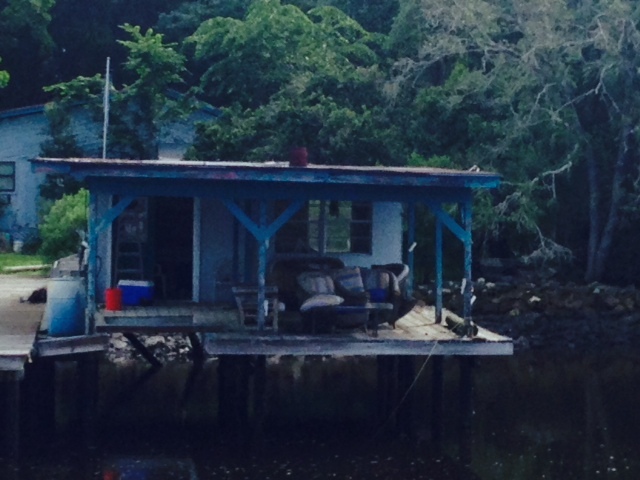 A different type of cabin…. 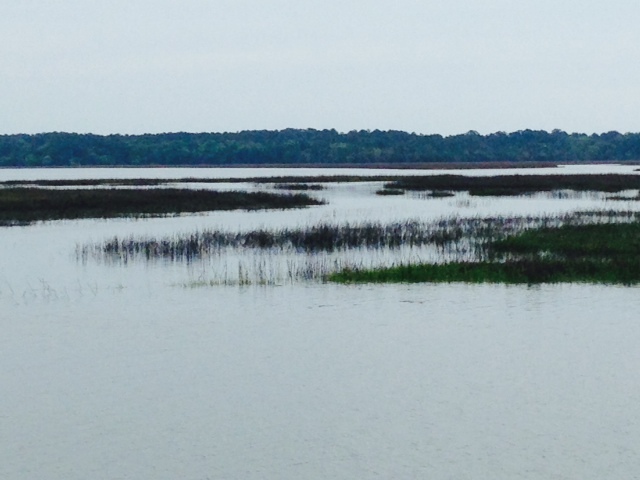 The water is often shallow a long way from shore in the bayous and estuaries of the Low Country, so docks are sometimes quite long to reach water deep enough for a boat. Upon reaching Beaufort, I had made arrangements to change the four fuel filters on the boat. While I’m religious about changing the oil and oil filters, I completely neglected the fuel filters then suddenly realized they hadn’t been changed in nearly 6,000 miles! 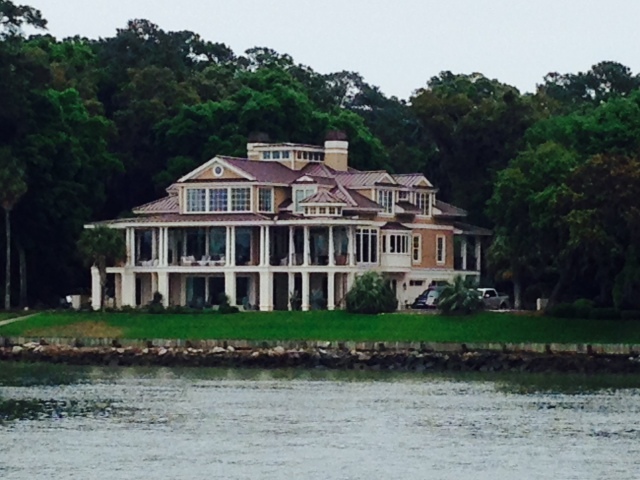 Trees are king in Beaufort, and trump motor vehicles. 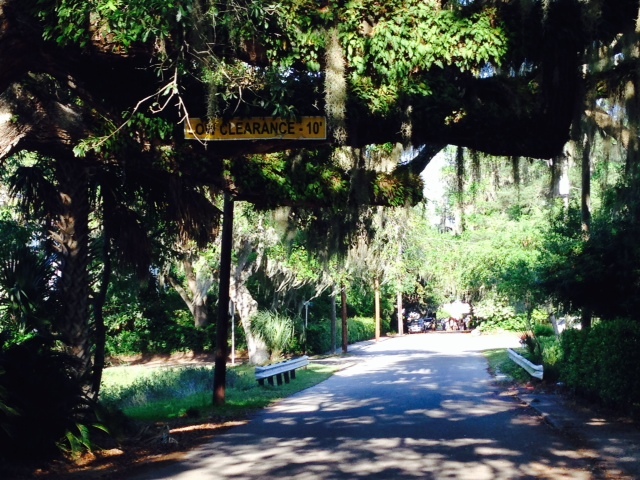 The branch from this live oak provides just 10 foot clearance over the roadway – rather than cut the branch off, vehicles that can’t fit must go around. 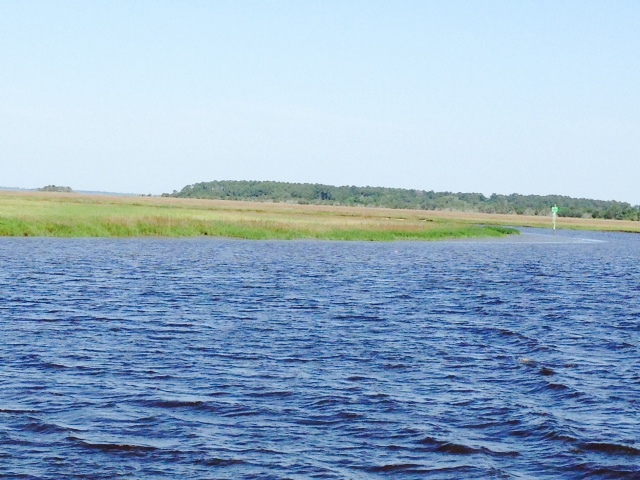 We are still in the Low Country, winding our way through tidal estuaries, bays, creeks, and occasional man-made cuts through the marshes to connect one waterway to the next. 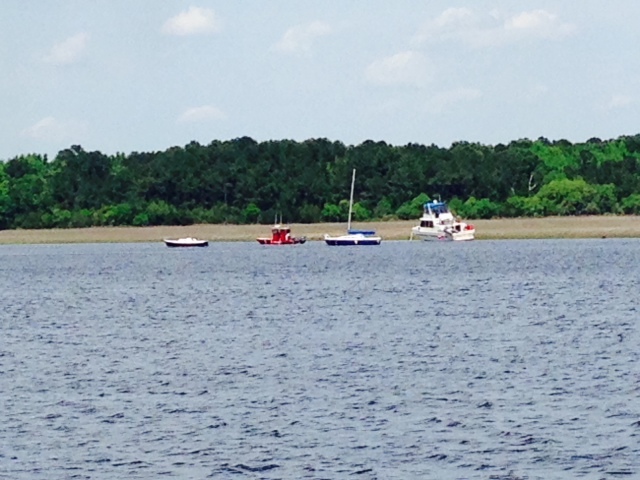 A sight all boaters hate to see – one mistake of some sort and this cruiser went aground, The red boat to the left of the cruiser is a TowBoat/US boat attempting to pull the cruiser off. 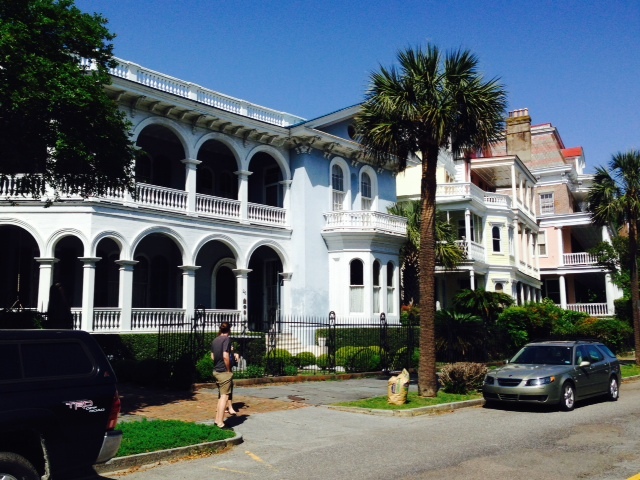 Charleston is a vibrant, beautiful city. 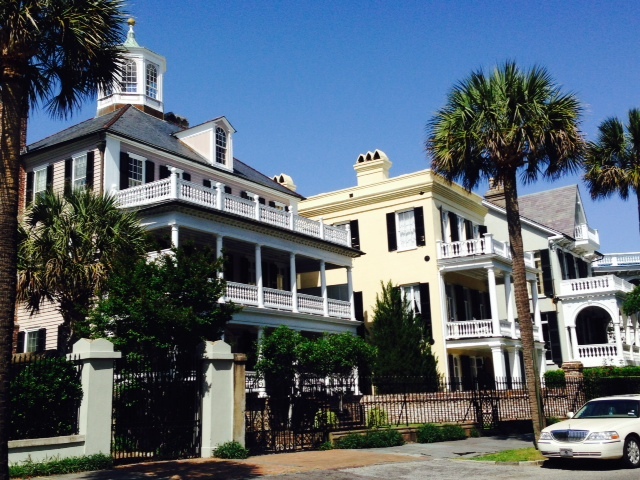 But no review of Charleston would be complete without a discussion of its history, which is tightly intertwined with the fabric of the city. 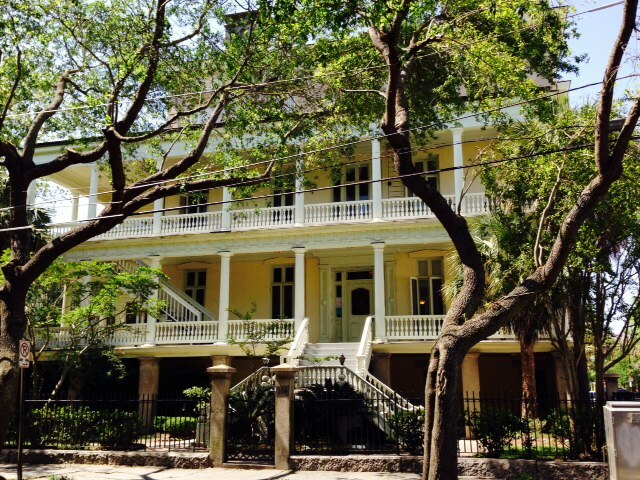 Rice then cotton brought huge riches to an elite group of plantation owners – by the 1770’s, nine of the ten richest men in America lived in South Carolina. However, those riches were the product of huge amounts of slave labor, as both crops were labor intensive. 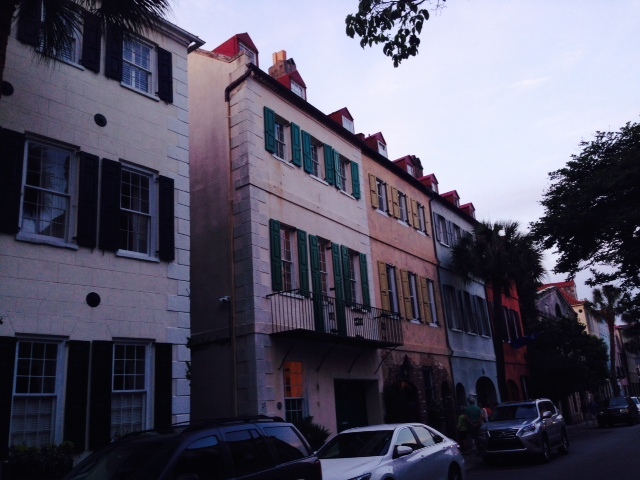 By 1708, there were more slaves in South Carolina than white people. Fearing rebellion, the state legislature passed the South Carolina Slave Code of 1740; the harshest state law in the country to control slaves, the law declared that slavery was “hereditary and perpetual”; that it was illegal to teach a slave to read or write; that a slave could not testify in court; and that a slave could be executed for plotting to run away. The dispute regarding slavery was emotional and divisive as early as the writing of the Constitution, threatening to dissolve the union before it got stated. Little consensus could be reached, so the final Constitution essentially avoided the subject altogether – nowhere do the words “slave” or “slavery” appear in the Constitution. However, in order to preserve the union, many compromises were reached (a process that seems missing from today’s political environment). For example, in an ironic twist of positions, southern states wanted slaves counted as people for the purposes of representation, while non-slave states argued that “property” couldn’t be counted for representation – both sides compromised, agreeing to count each slave as 3/5 of a person. Importation of slaves was allowed to continue until 1808, after which it became illegal. The Missouri Compromise of 1820 diffused another crisis by limiting slavery to areas south of the Missouri border. 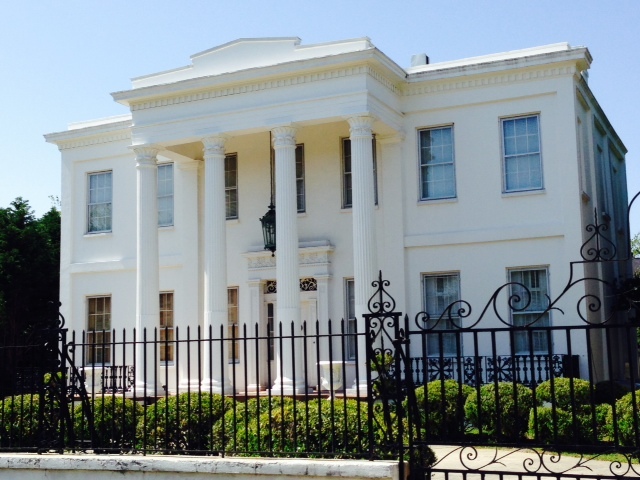 Another crisis erupted when a northern-dominated Congress passed federal tariff laws in 1828 and 1832 that taxed imported manufactured goods – tariffs which cost the South but benefitted the North. 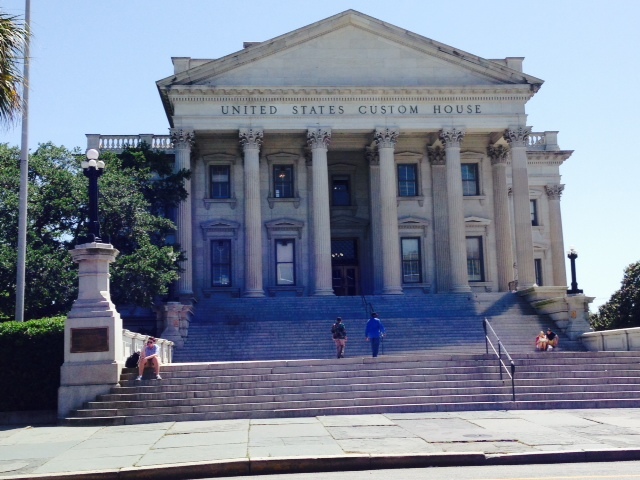 South Carolina voted to nullify the tariffs in South Carolina and refused to collect them. President Jackson sent federal troops to enforce the tariffs; as a result, John C. Calhoun, who was Vice President of the U.S. at the time and an avid defender of slavery and the South, resigned the Vice Presidency in protest, and the first stirrings of secession were uttered. Again the crisis was resolved by compromise when Congress passed a revised tariff law that was accepted by both sides. As the nation continued to expand and the abolitionist movement grew in the North, conflict intensified. The Fugitive Slave Law of 1850 was another compromise – Utah and New Mexico were admitted to the union as slave states, and California as a Free state, but the South got an enormous benefit from the law making it illegal anywhere in the country to aid fugitive slaves. In 1854, violence erupted as a result of the Kansas/Nebraska Act, which allowed new territories to vote whether to be slave or free as each side tried to intimidate voters – the violence peaked in Kansas where Northern Whigs, Free Soilers, and some Democrats who had fought against passage of the Act joined forces and formed the Republican Party. The abolitionist movement suffered a huge setback in 1857 when the Supreme Court issued the Dred Scott decision – Dred Scott was a slave who sued in federal court for his freedom on the grounds that he had previously lived in free territories so could not be enslaved. The Court not only ruled against Scott, but went on to say that he could not sue because blacks had no rights of federal citizenship and had no rights that white men were bound to respect. Finally, compromise failed – enraged over the election of Abraham Lincoln to the presidency, South Carolina seceded from the union, followed soon by six other southern states. 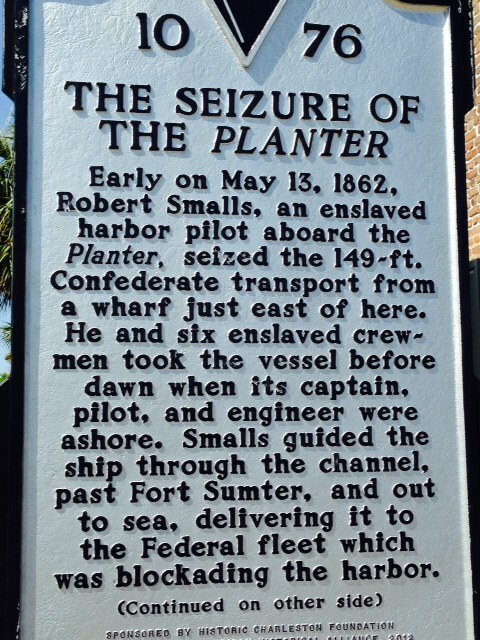 The war officially began at 4:30 AM on April 14, 1861 when the South Carolina militia started shelling Fort Sumter at the mouth of Charleston Harbor; the bombardment lasted for 34 hours until the union defenders surrendered. 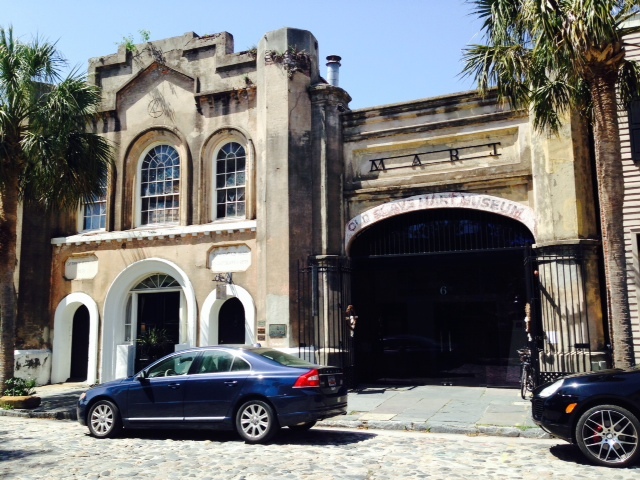 The Ryan Slave Mart in downtown Charleston, now an important museum, was the first of the slave markets to move indoors in 1856 when abolitionists increasingly disrupted outdoor auctions. 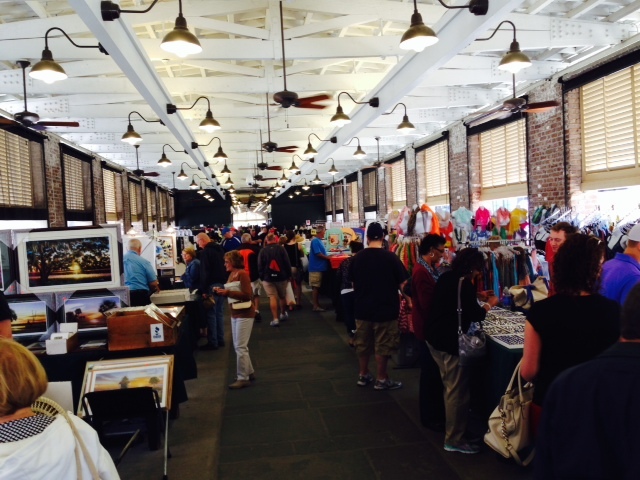 While over 40 such indoor markets opened up. Ryans was the largest and most infamous, buying and selling tens of thousands of slaves from throughout the South, often splitting families to sell individuals to the highest bidder. 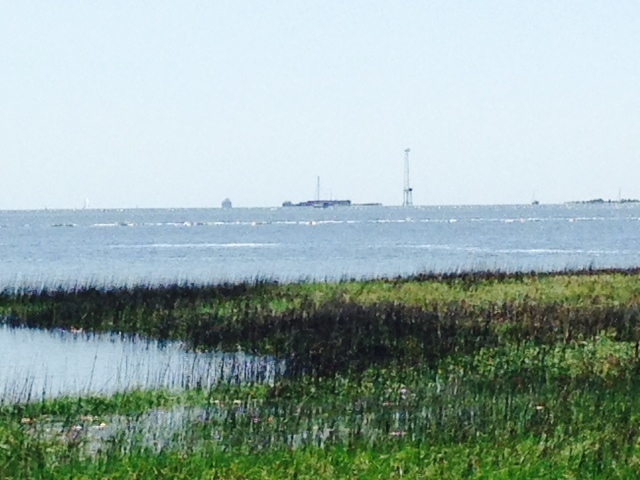 Fort Sumter as seen in the distance from the mainland waterfront in downtown Charleston. In one of history’s strange ironies, Lincoln planned but did not attend a celebration at Fort Sumter on April 14, 1865 to commemorate the re-unification of the nation exactly 4 years to the day after the American flag was lowered by General Anderson when he surrendered the Fort to the Confederacy in 1861. 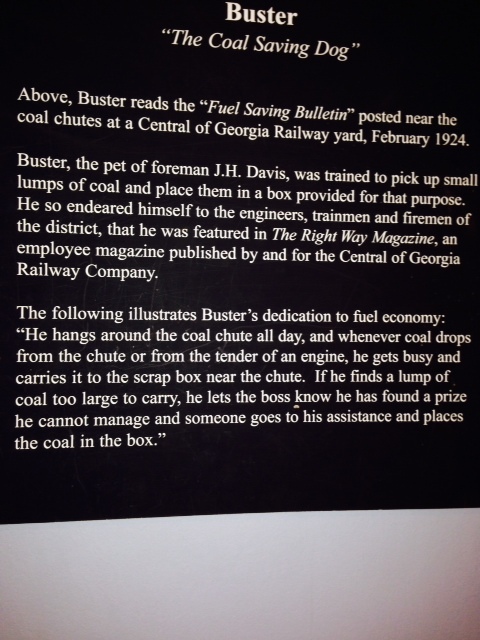 Anderson kept the flag in a bank vault during the war. At the celebration, Anderson re-raised the American flag, then toasted President Lincoln, declaring ” I give you the good, the great, the honest man, Abraham Lincoln”. That very night Lincoln was assassinated in Washington. 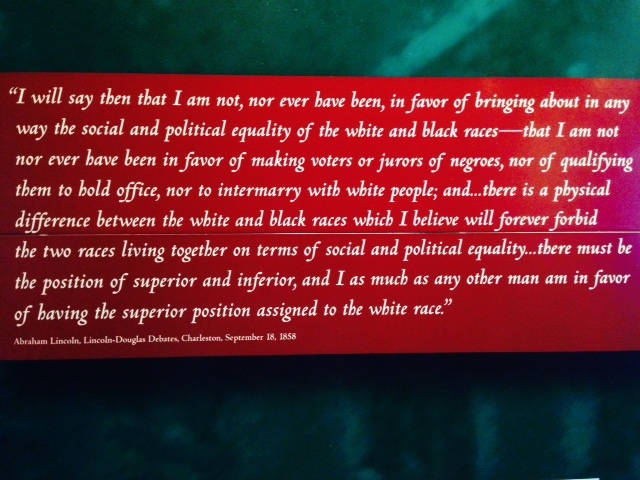 This surprising quote by Lincoln during one of the Lincoln-Douglas debates in 1858 shows how Lincoln’s objectives and even his thinking evolved over the years of his presidency and the war. 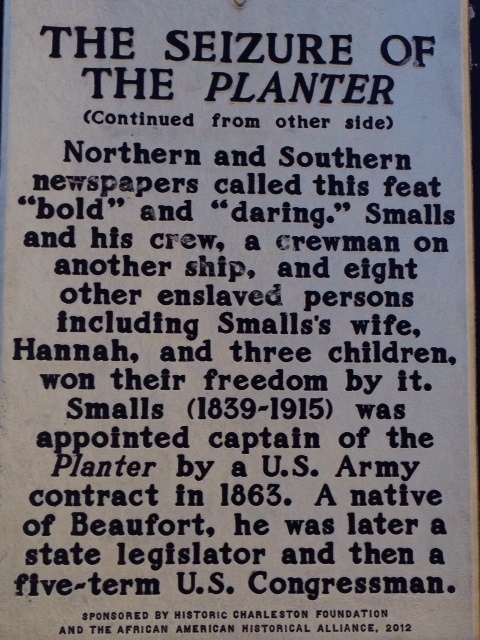 The story of the PLANTER is just one example of the courage and heroism of many blacks before and during the Civil War (the rest of the story is in the picture below). The movie GLORY which depicts the heroism of the 54th Massachusetts Volunteer Infantry, which was the first formal unit to be made up entirely of blacks, takes place when the 54th attempts to capture Fort Wagner on Morris Island in Charleston Harbor. 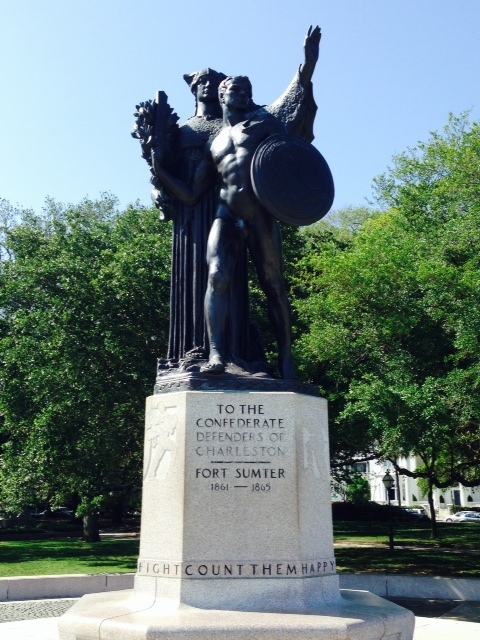 A memorial to the Confederate soldiers who were killed or wounded during the war. 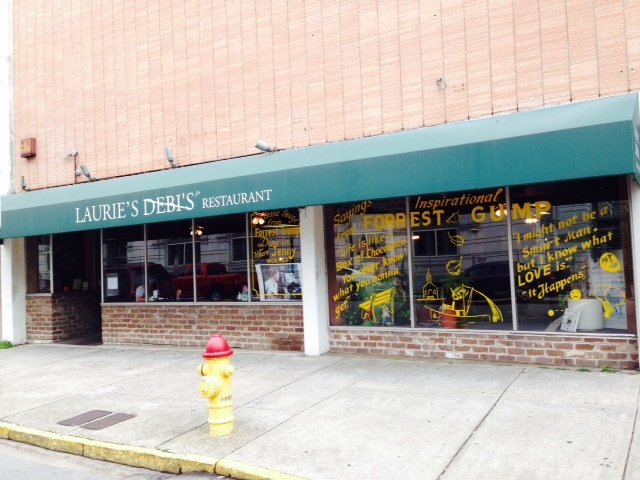 Interestingly, I haven’t seen a single Confederate flag in South Carolina. 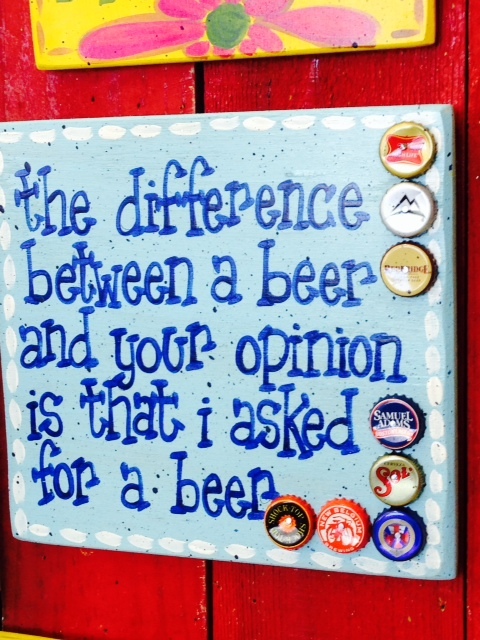 I did see an occasional one in Mississippi and Alabama. Incidentally, if you want to read a terrific book about the struggle that blacks faced after the Civil War – actually after Reconstruction when the Jim Crow laws in the South really took affect – and the social implications for them and for the country, I highly recommend “The Warmth of Other Suns” by Isabel Wilkerson. The Pulitzer Prize winning book chronicles one of the great untold stories in American history – the decades long migration of black citizens who fled the South to northern and western cities in search of a better life, and the growing pains which that migration caused in the cities to which they fled. 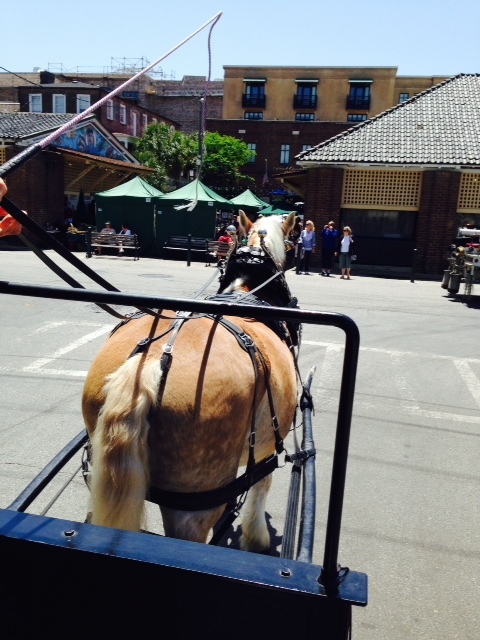 We took an hour-long narrated carriage ride to get an overview of the city – this is Dan, our one horsepower engine. Our guide was a history professor from Charlestom College who loves horses and history, so she was the perfect guide. 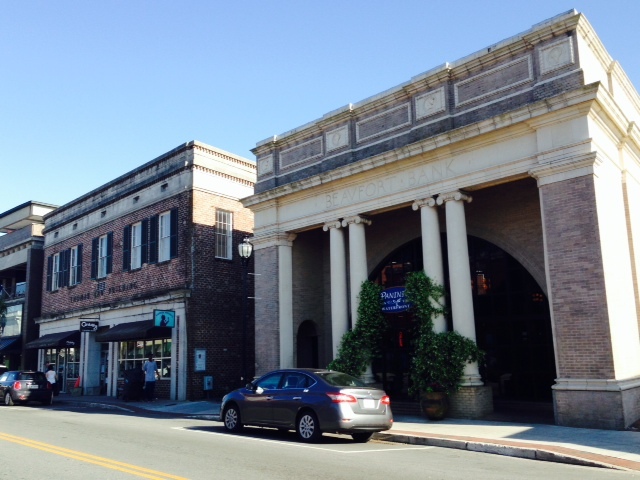 The center of activity in the historic district is the series of market buildings where arts, crafts, food, and interesting sundries are sold. 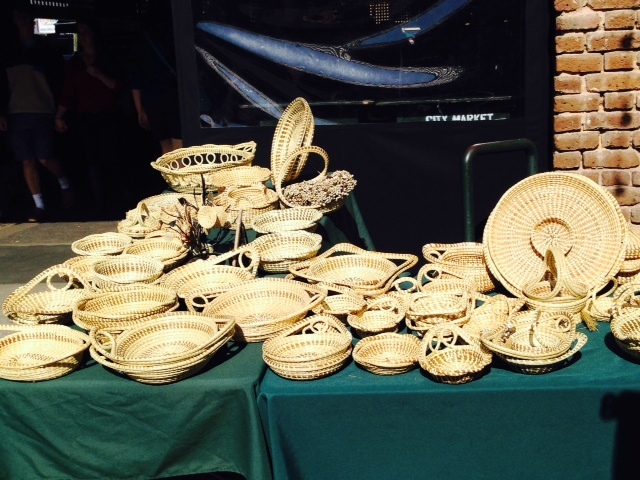 Hand woven baskets made from local plants can be found throughout the markets. 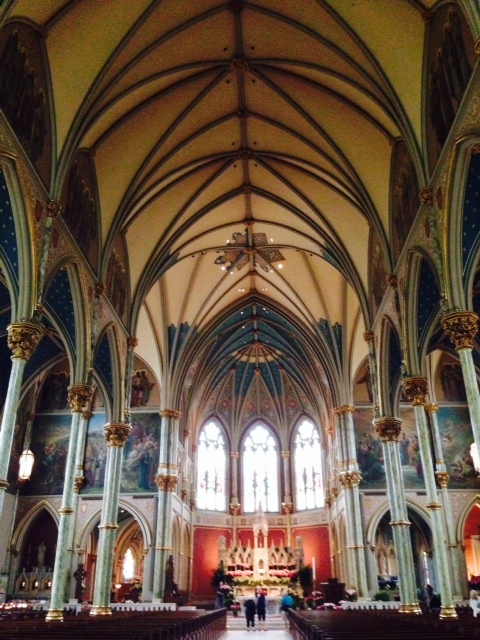 Some take hundreds of hours to make and can cost up to a thousand dollars for the more intricate ones. 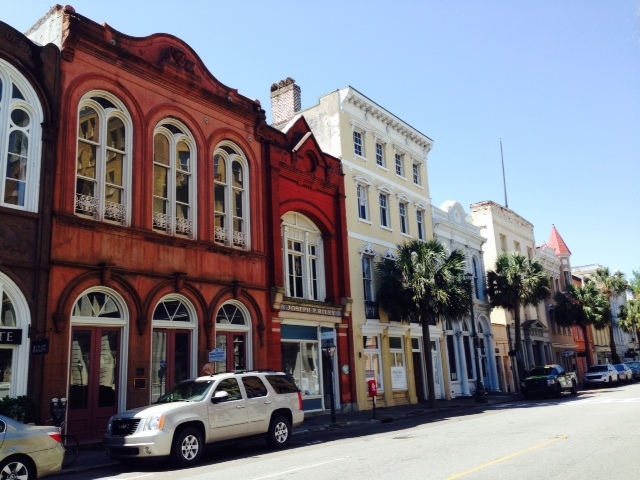 A typical street in downtown Charleston, as are the next few pictures. 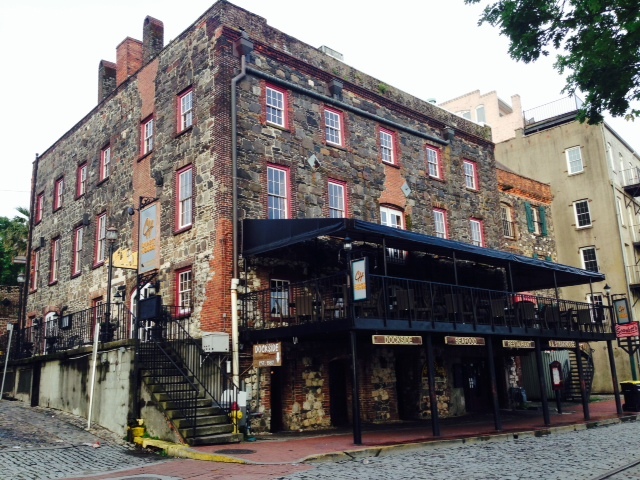 Note the round black plates in the façade of the building on the left. 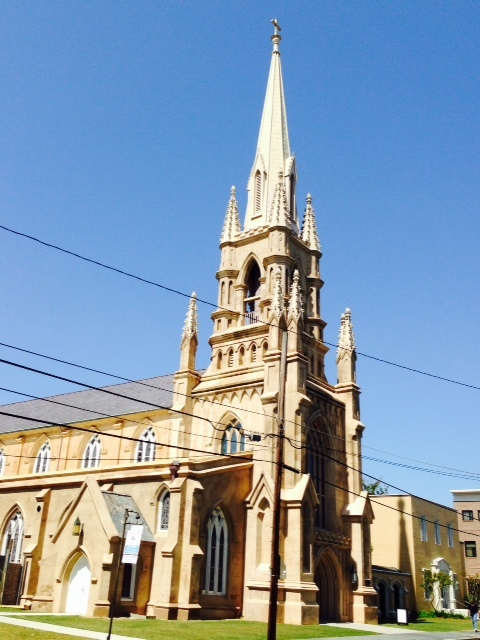 A devastating earthquake hit Charlestown in 1886, destroying many buildings. Some, like this one, were able to be stabilized and saved by inserting crisscrossed steel rods attached to the outside facades of the building. 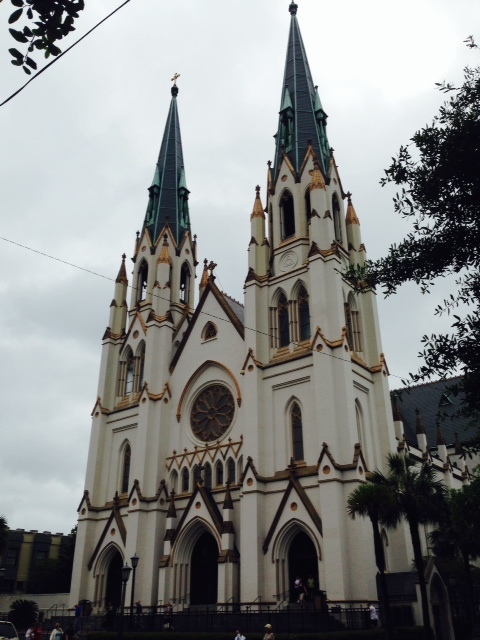 Of the many churches in the city – after all, this is the South – the Cathedral of St. John the Baptist is the most spectacular. 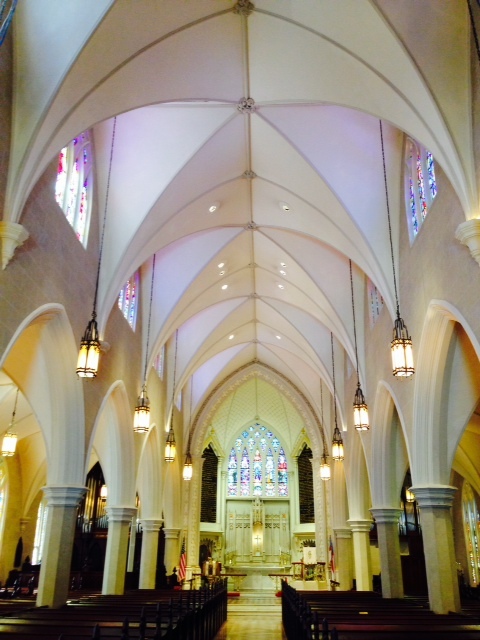 The inside is as spectacular as the outside. 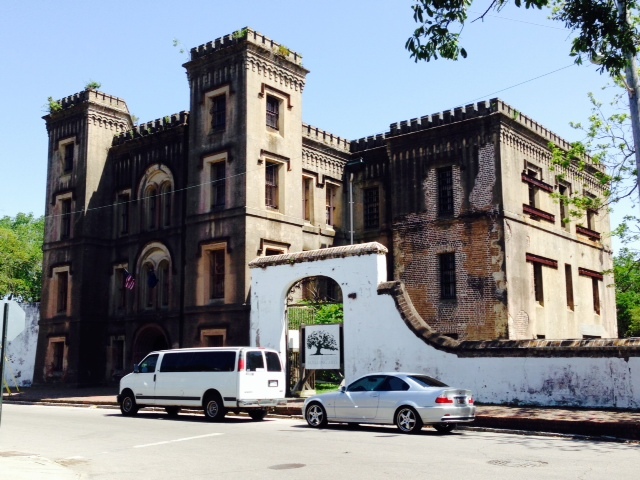 The Old City Jail, which was operational from 1802 to 1939 and is now home of the American College of Building Arts. 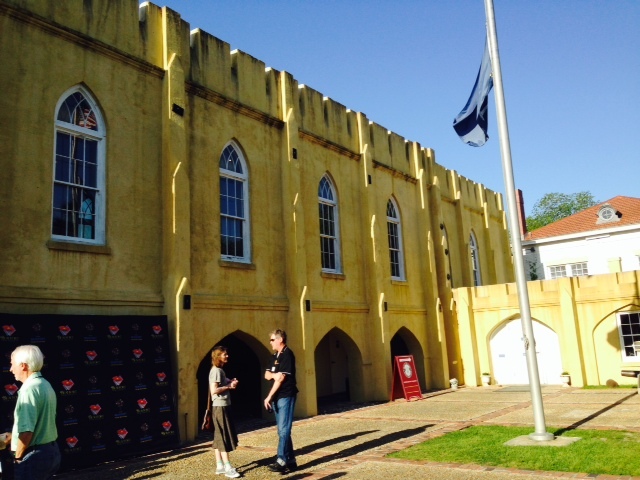 Known for the brutality which occurred here, the jail housed captured pirates in 1822 awaiting hanging, and also housed union prisoners during the Civil War. 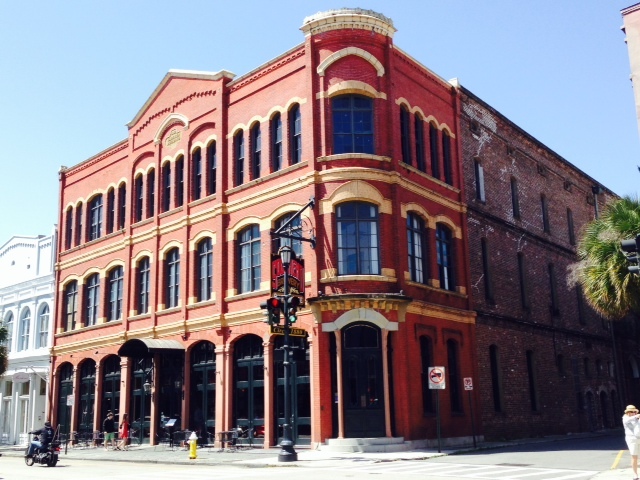 The historic Dock Street Theater, America’s first theater, was the first building in America built exclusively to be used for theatrical performances. The new musical “Catch Me If You Can” – the story of Frank Abagnale depicted in the movie of the same name staring Leonardo DiCaprio and Tom Hanks – was playing Friday night, so Jake, Elissa & I bought tickets and went to the show – a great performance! 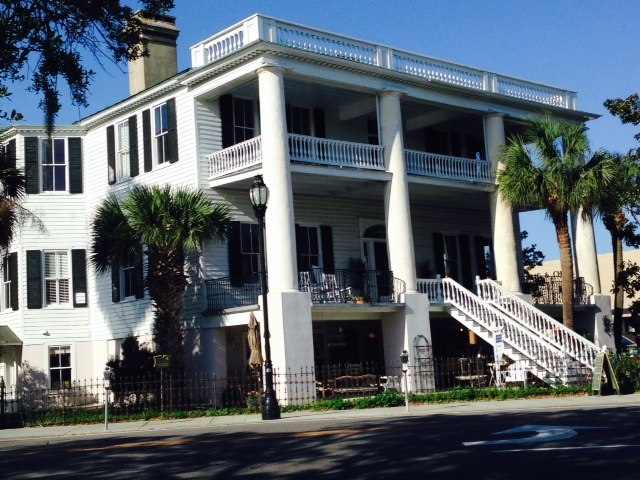 It’s worth making a trip to Savannah by itself! Now I have to continue my research and find #1 in the U.S and # 1, 2, 3, & 4 in the world. Tomorrow we continue to head north!